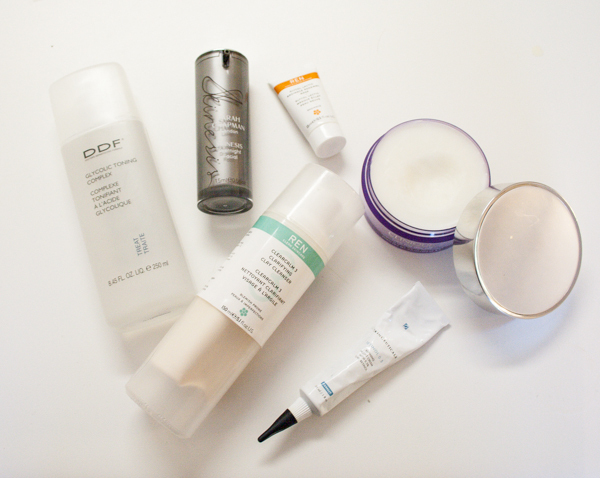 Although I am now in my late 20s, I still suffer from the occasional breakout and have oily & congestion prone skin. It's less than ideal, but earlier this year I made a pledge (to myself) to find skincare products that would improve my skin, rather than spending more and more money on makeup to simply cover up my imperfections. This was quite a daunting challenge because with all of the skincare products and advice out there, I usually end up feeling overwhelmed and unsure as to what will be best for me! Reading Caroline Hirons's blog Beauty Mouth (in particular her post here about finding a routine) finally made things start to *click* in my mind and I began to understand what products I needed and--most importantly--what purpose they served. All of the products pictured above have become firm favorites of mine over the past six months or so. They have worked wonders for me, and if you have a similar skin type to me, I hope that they might work for you as well! DDF Glycolic Toning Complex: I have repurchased this time and time again. Depending on the day and what other products I'm using, I generally use this between once and twice a day. Gycolic acid (an AHA) is a wonderful chemical exfoliator for your skin. It is great for combating wrinkles, evening and brightening skintone, and improving skin texture. This 'toner' is nothing like the harsh astringents I used as a teen to try to combat my acne, and no other product has produced the results that this has (for me at least). Sarah Chapman Skinesis Overnight Facial: Sarah Chapman is a renowned facialist in London and her products have become quite the hit on that side of the pond. I picked up this serum from Space NK (in the US) in the hope that it would live up to its 'Overnight Facial' name. Much to my surprise, this product is truly great! No matter how little sleep I get, if I slap this on before bed, my skin glows the next day. It smells lovely (one of those indescribable beauty scents--a bit floral and a bit citrusy, perhaps?) and has a unique texture--somewhere between a facial oil and a more viscous serum, like Estee Lauder Advanced Night Repair. I usually put this on after using my Alpha H Liquid Gold. REN Glycol Lactic Radiance Renewal Mask: This is easily my favorite mask of all time. I've talked about it before here, so to keep this short I will say that it never fails when my skin is looking a bit dull and congested--after slapping this on for a half hour or so, my complexion is always clearer and brighter! The size in the photo is just a sample from a REN kit, as I used up my full size of this mask last month and am trying to hold out until the Sephora Friends & Family sale to buy a replacement! Clinique Take the Day Off Balm: This is a cult favorite that I've only recently gotten my hands on (I really, really like it though) but it generally serves as a placeholder for oil cleansers & balms. I used to use those facewipes to remove my makeup before using a cleanser in the evenings. Using a cleansing oil or balm (which are solids until the warmth of your hands liquifies them) has made a huge difference to my skin. The reality is that facewipes might be quick, but they really don't remove makeup (rather, they move it around your face). Once you oil cleanse, you'll never go back! Skinceuticals 0.5 Retinol Refining Night Cream: If I had to choose one single product that has done the most to improve my skin, this would be it. Within just a few days of beginning to use this Retinol cream, I noticed dramatic improvements (smoother skin, fewer breakouts, smaller pores). I never experienced the dreaded 'purging' stage that lots of people experience with Retinols, nor did I suffer through a dry, flaky skin period (another common complaint), probably because my skin is so oily to begin with. Nonetheless, I stick to using this only about every other night. I apply a pea sized-amount to my skin before bed. I normally wait about 30 minutes, and then apply a serum (like the REN Omega 3 Night Repair Serum) and a moisturizer, if needed. REN ClearCalm3 Clarifying Clay Cleanser: After using cleansers for 'oily' skin for years without realizing that they were stripping my skin of its natural oils, which then made it produce more oil, I've learned that more mild cleansers are best for my skin. I have a few that I like (the DDF Blemish Fighting Cleanser and the Amore Pacific Treatment Cleansing Foam, for example), but this clay-based formula by REN stands out from the pack. It feels gentle and refreshing on my skin, but it also seems to really clean out my pores. Plus, REN is all natural and the packaging on this is brilliant--you can get the exact amount you want with the pump, and it ensures that every last drop of the product in the packaging gets used! Chanel Le Jour de Chanel: Somehow this didn't make it into the picture (I completely forgot to toss it in the pile), but I love this product. Part of Chanel's new Resynchronizing Skincare line (available at Chanel.com or Nordstrom.com), it contains salicylic acid and jasmine. I apply this just before applying my face primer and it has really done wonders to smooth my skin and prevent white heads and clogged pores. I'm going to be trying the other two products from this collection (La Nuit de Chanel and Le Weekend de Chanel) soon! What are your favorite skincare products? I'm always on the hunt for new products, so please let me know in the comments! LOVE LOVE LOVE all your choices!!! I wasn't crazy about the ren mask but I have a couple of samples to use next month so hopefully I'll love it?? My friend has used that DDF toner and swears by it as well. She's testing out other things but will go back to that at some point for sure. I should check out that skinceuticals retinol cream and REN cleanser!! I used a retinol product awhile ago, but stopped to try other things and for whatever reason (just being sidetracked probably!) I haven't tried another one...but it does such great things for your skin so at some point I definitely need to go back. Yay for skincare and finding things you can depend on and that work so well for you!!! I have just downloaded iStripper, and now I can watch the hottest virtual strippers on my taskbar.